People bring big dreams to this big city, but they live small to survive. They rent studio apartments with tiny kitchens. They walk diminutive dogs. They work in cramped cubicles. They do little gigs. They have trivial arguments. They eat microgreens. Wee is us. And this mini snowman—about 18 inches high—was right on trend. He popped up on a townhouse railing after a March snowstorm that was slighter than expected. Tidbit accessories completed his look. Baby carrot for nose, celery scraps for hair, pebbles for eyes and the spindliest of twigs for arms. And yet, small is beautiful. The frosty sculpture had presence. Think Billy Porter in his velvet tuxedo gown at the Oscars. Think Constantin Brancusi at the Guggenheim. Under its anonymous creator’s hands, the ephemeral snowman disrupted the three-circle cliché and turned a simple brown railing into a majestic pedestal. It was something all together new and fresh. True outsider art. Or at least outside. In the dead of winter, candles are alive. I light them every morning to wake up to beauty. Outside my window, unbroken grey wraps sky and sidewalk in an enervating hush. The city is in hibernation. At the kitchen table, my slim candle flames dance to their own music. A wax pinecone sinks inside itself, preserving its brown spikes and spirals as it melts. Another, “Feu de Bois” from Diptyque, sends out a wood fire scent. A few are just glass votives, because, why not? By mid-February, things are looking up. Daylight begins to stretch. Some afternoons are still too grim and dark and cruelly cold. Others hold surprises. Walking in Central Park toward dusk, I see black trees lined up like logs against the urban skyline. Glass buildings shoot gold and orange embers at the sinking sun. Everything is lit. Warmth spreads. It’s a fireplace in the sky, New York style. The polar vortex is here. From Maine to Michigan, people are stuck in a freezer of ice, snow and brutally cold temperatures that threaten skin and spirit. My mind flashes back to this icy guy-in-a-box, Snowman, installed in MoMA’s Outdoor Sculpture Garden last summer. The frosty copper-coated statue was a magic trick in June’s humid heat. A clever study of contrast and form by Swiss artists Peter Fischli and the late David Weiss. It amazed and amused me. Now the extreme cold darkens my perception. I have seen the Snowman, and he is us. There they are, lined up like sentinels behind the scaffolding. I am always excited when the Christmas trees come to town, even if I never buy or own one, because they transform barren concrete sidewalks into magical tiny forests. Every time I walk by the fragrant firs, pines and spruces, I am transported from grey New York to my own private Narnia. Arriving around Thanksgiving and lasting until Christmas Eve, the seasonal trees elevate mundane places and turn routine chores into an adventure. You never know who might run out for a tube of toothpaste to a 24-hour drugstore at 2 a.m. and come home instead with a ten-foot spruce. And I can’t help wondering, are these truly just trees, or maybe—for those with special vision—a line of deep green uniformed soldiers guarding a dark red castle? Each time I walk by, I breathe deeply and stand a little straighter. You never know who might be watching. Fall put up its own form of resistance this year. Days stayed warm into late October. Leaves refused to turn. I looked everywhere for seasonal progress but couldn’t find it in the usual places. A trip upstate to hunt color on Columbus Day disappointed. In the city, crews strung holiday lights around trees with bright green leaves, as if they were in Florida or California. The day before the midterm elections, change blew in overnight. Locusts and lindens filled the streets with their golden glow. Ocher leaves lifted and scattered in the wind. Coming up from the grimy subway underground, I entered a forest of light. It was a harbinger. 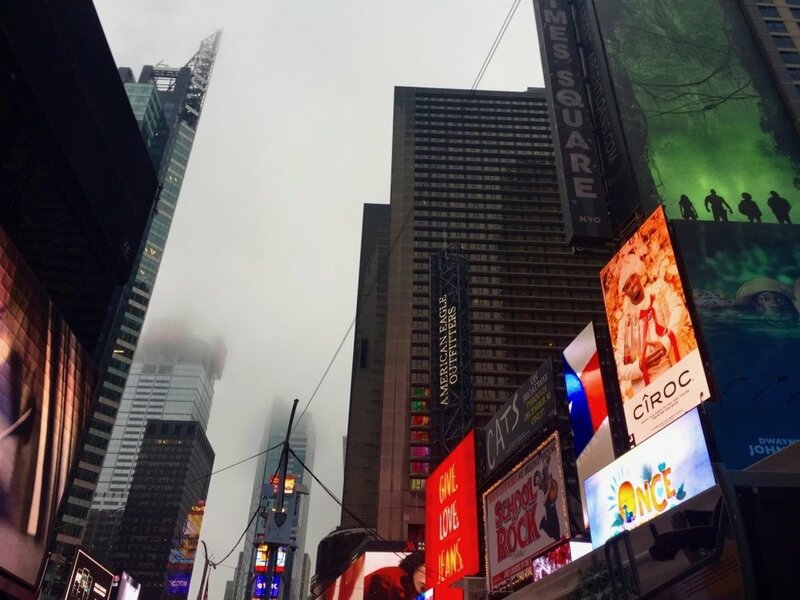 Like its ambitious citizens, the Manhattan skyline is always reinventing itself with an eye to the competition. The newest super tall skyscrapers—some still with cranes—look like fishing lines to the stratosphere. Are they trying to catch birds, helicopters, clouds? Here are views for billionaires (and maybe global criminals) who need to show they are on top of the world. Not just the one-percent, but the one-upper percent—the “my treehouse is higher than yours” club. Like NBA basketball players or super models, the towers look down imperiously on older buildings. The formerly imposing now looks short and squat. But reflected in the dimpled water of the Central Park Reservoir, the Super Talls shrink like Legos and belong to everyone. Nature brings them down to size, and wins. It took me decades to figure out that the New York City summer ends emotionally, but not literally, at Labor Day. Back to school supplies, best-of-fall media previews, and chilly boutiques stocked with winter coats all conspire to convince me that fall has started. In reality, it's still wretchedly hot. The summer sun continues to laser the concrete, my iPhone says it "feels like" 100 degrees, and a short walk outside is an act of faith and resilience. Inside, high humidity swells all my apartment doors so that they jam their jambs. They grunt with complaint. The dog days of September? I dial back to the August morning I awoke at a friend's beachside cliff house in Encinitas, California. From my perch on high, I watched a dog race joyfully through the surf while his owner trailed languidly behind with leash and morning coffee. A great splash of ocean lies between them. It's that cool, empty space I jump into now. Humans aren't the only species who invade and conquer. Plants are guilty, too. I was awestruck by acres of red-tipped green succulents flowering under a blue California sky next to a turquoise ocean. Then they were outed as a lethal beauty. 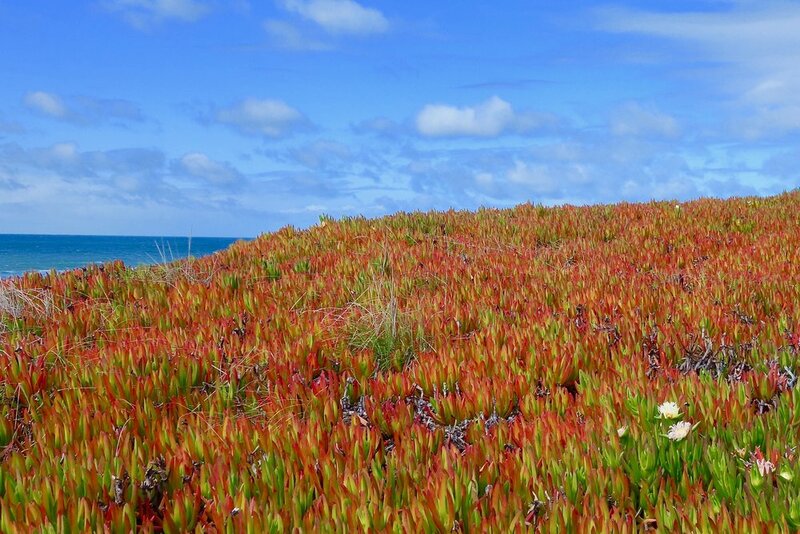 An expert at the California Coastal Trail Association identified my fan photo as Carpobrotus edulis, or Ice Plant, and warned me by email that it "forms a large, thick mat that chokes out all other native plants and alters the soil composition of the environment." Even worse, as "a coastal invader, it competes with many endangered, threatened, and rare plants." Ice plant shows that colonialism is built into natural design, but the forward-thinking imperative is for us to weed it out. It's a mysterious truth that even a road to nowhere must lead somewhere. I’ve always loved the news item about the couple who followed their GPS so closely they ended up driving their rental car right into the ocean. An ocean of nowhere to them, certainly, but not to the people who walked the beach or splashed in its water. The furrowed tracks on this dusty old ranch road in Templeton, California, end in an infinite distance I'll never see but some locals might know well. Above them, a plane's white contrail pierces the deep blue sky like an arrow. When you think about it, nowhere can seem like a noun, but it's really just a point of view. 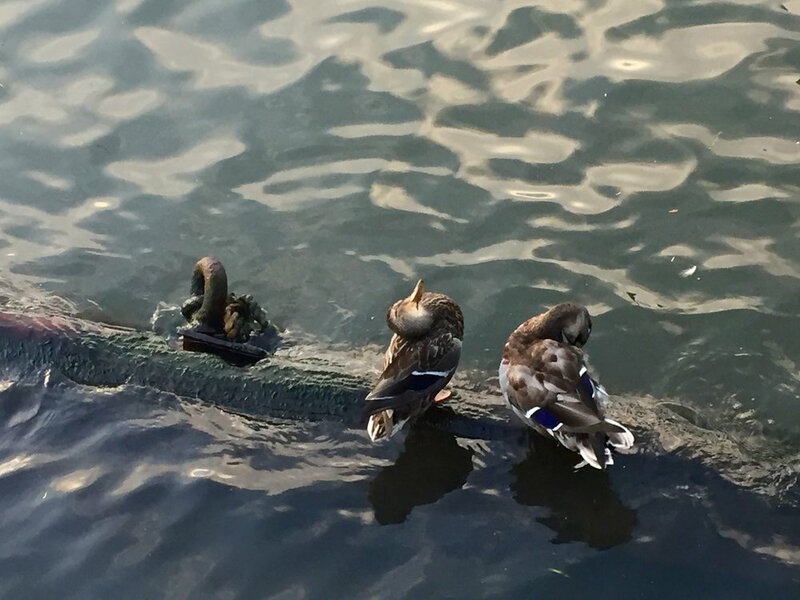 Walking near the 79th Street Boat Basin, I noticed that this rusted iron nautical ring bent its neck in the same graceful arc as two female Mallard ducks perched beside it. Bolted and yoked, it seemed burdened by time and water. Immediately, I thought of T.S. Eliot's third. In his epic poem, The Waste Land, Eliot asks, "Who is the third who walks always beside you...Gliding wrapt in a brown mantle, hooded...who is that on the other side of you?" Eliot's "third" refers to a guardian angel or spiritual support (see Third Man factor for why). Here, of course, it is the ducks who can glide. The ring gives strength by being strong and immobile. I loved watching the two ducks flex and swivel their necks next to an imagined mirror third. A few seconds later, they swam off. The person (or people) who created this got to say with pride: "Today I made love on the beach!" I stumbled across it on a long walk and could say, "I found love on the beach." And then I realized that the only way to make this love everlasting was to shoot it. I wish I could witness the total eclipse on August 21, but I'll have to make do with a partial experience in my home city. It doesn't help that Annie Dillard wrote in her brilliant 1982 essay 'Total Eclipse': "Seeing a partial eclipse bears the same relation to seeing a total eclipse as kissing a man does to marrying him." Oh well. Eclipses are dramatic because they connect polar opposites. We expect the sun and moon to revolve in harmony. When the moon obstructs the sun, it breaks every rule we know about nature. It's unbalancing. Dillard wrote that seeing the eclipse in Yakima, Washington was like "slipping into a fever, or falling down that hole in sleep from which you wake yourself whimpering." Night skies of textured velvet can also feel like fever dreams. Vaporous skies fascinate me. I took this photo through our windshield as we drove in a purple haze late into the night. It felt to me like clouds were devouring the moon—a midnight of the soul. Then I remembered that both clouds and moon were in fact lit by the sun.